Ben earned a bachelor of music education degree from the University of Oklahoma in 1993, studying with Dr. David Etheridge and Steve Girko, and a master of music degree in clarinet performance at Louisiana State University in 1995, studying with Steve Cohen. Subsequently, Ben has studied with Ignatius Gennusa, Ben Armato and Christopher Wolfe. He entered the U.S. Army in 1995, serving 4 years as solo clarinetist with the Army Ground Forces Band in Atlanta, Georgia. 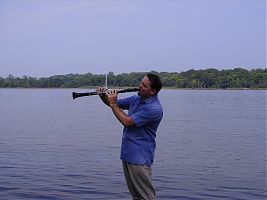 Since 1999, Ben has been a member of the United States Naval Academy Band, Annapolis, Maryland, where he currently serves as e-flat clarinet soloist in the concert band. In addition, he plays baritone saxophone in the Academy’s jazz band. Other musical experiences include performances with many professional orchestras and leading his popular traditional style jazz band—the REDWINEJAZZ BAND. Ben completed his first full-length compact disc recording on the Mapleshade record label, which was released in December, 2004. In October 2003, Ben was invited to be a featured performer at the China 2003 Music Convention in Shanghai, China. His performance there was hailed in the state sponsored music journal as “stellar.” He has been featured as a soloist in 2004, playing the Molter e-flat clarinet Concerto #3, and the Weber Concertino, the latter with the “Villar del Arzobispo” symphonic band in Valencia, Spain. On February 6th, 2005, Ben performed a jazz recital and conducted master classes at the Royal Welsh College of Music and Drama for the annual Single Reed Convention. In 2004, he presented the world premier of a clarinet quintet written for him by acclaimed composer John Stephens. He subsequently performed this work, as well as others, in a full recital at the 30th Annual Oklahoma Clarinet Symposium in June, 2005. This quintet was recently recorded by Ben and the Sunrise Quartet and has been released on the AmCam Record Label. December, 2007 marked the realease of a 4 DVD set of re-releases of Harry Langdon silent films by All-Day Entertainment. Ben was featured prominently on the soundtracks with his jazz trio, another trio, and with the Snark Ensemble in classically oriented scores. Contact Ben for more information! As a freelance musician, Ben can be heard around the Washington, D.C. and Baltimore area playing the entire family of saxophones and clarinets in several popular jazz bands and symphony orchestras. He is a member of Washington Musica Viva, a chamber music ensemble that performs every month in the Washington, D.C. area. Ben is an official Buffet Crampon artist and performs exclusively on Buffet clarinets, Canyes Xilema reeds and Gennusa “Excellente” and REDWINE mouthpieces. He thinks the Gennusa mouthpiece is so good, he bought the business in 2003 and continues the tradition of fine mouthpiece making taught to him by Iggy Gennusa! Stumbled on you via the Internet. Your Grandfather, Loris Wiles, was my clarinet teacher at Central State and before until 1969. What can you tell me about him after that??? Thank you! Extremely hard to reveal these helpful page or site. I have numerous tools and accomplishing legitimate article of these worked admirably and vitality keeps on being seeing about this web blog. You can use this best essay writing service for any kind of academic writing work.